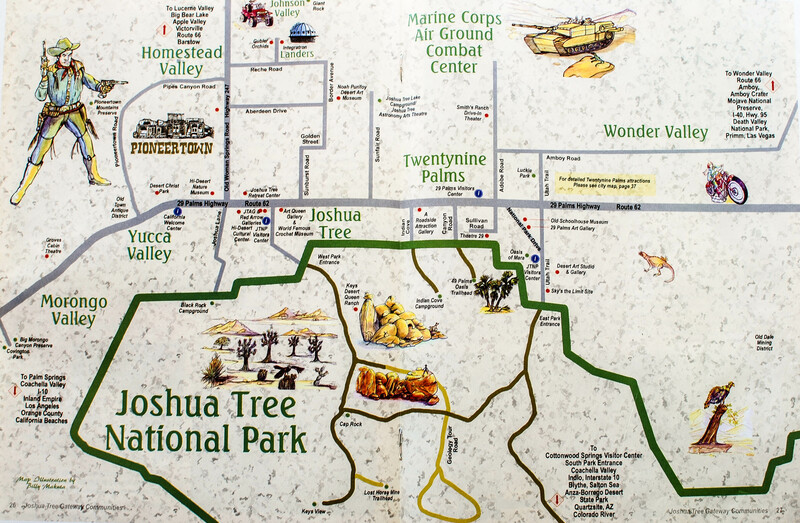 It strikes me as ironic that not long ago I had to locate Joshua Tree, California on a map because I had never heard of it before and now I am writing my very own guide to it. But truly, it’s about time! I’ve visited and lived in the high desert town on and off for the past three years now and I’m always rattling off how much I love, love, love the place to anyone who will listen. In fact, I wouldn’t be surprised if it’s the place I ultimately lay down roots someday. And if you know me, well, I wouldn’t say that about just any old place. I have multiple Joshua Tree posts scattered throughout the blog but it’s due time I gather up all that amazingness in one place. So without further adieu, if you’re planning a trip to Joshua Tree or its neighboring towns of Yucca Valley and Twentynine Palms, here’s my guide to the best of the best. It’s cute, it’s vegetarian, it’s friendly! The Natural Sisters Cafe is a must during your JT visit. Being so close to the park entrance it’s the perfect pit-stop to fill up on smoothies, sandwiches, salads and freshly baked goods before or after your trip into the park. Don’t be surprised if you unexpectably make a friend or strike up a conversation with a stranger here – it’s just that kind of place! Frontier Cafe is my go to cafe in Yucca Valley. Taking advantage of the great wifi and comfy seats, many of my posts have been composed here. They also have an amazing menu – I’m hooked on the grilled cheese sandwich – live entertainment, and an all around great vibe. I could people watch here all day. Located in Pioneertown and once used as a facade in a Hollywood frontier town, Pappy and Harriets is THE place to go for live music, good burgers, barbecue and drinks, and an eclectic mix of people. The inside decor is amazing in all its honky-tonk glory, but there’s also a great outdoor patio that’s not to be missed. Come in for some killer karaoke – or don’t…but do make sure you stop by The Joshua Tree Saloon. I mean, just look at it! While Pappy & Harriets is tough to beat, The JT Saloon holds its own. An order of French Toast, fresh-squeezed orange juice and a coffee, please! That’s my go-to brunch whenever I stop in at Crossroads Cafe, but if that’s not your thing the menu is expansive. But the food isn’t the only reason I stop in here, turns out I love gazing at the funky decor and all the LA tourists dressed in their finest hipster/boho-chic attire. Yes, beyond that massive sandwich is indeed a glistening pool… If enjoying a meal on an outdoor patio while hotel guests frolic in the waters and catch a tan strikes your fancy, then eat at the 29 Palms Inn. Not only do they have amazing food, but the inside decor is charming and warm. You can roam the grounds afterwards, visiting the small lake and organic farm where the restaurant sources its own fruits and veggies. I’m the kind of girl who likes her pizza thin and funky. With pizzas named David Bowie, Bada Bing, and The Cliffhanger, and ingredients such as sweet plum sauce and Guinness caramelized onions, you know you’re in for something unique. Pie for the People became an every Friday night occasion for me when I was living in JT. My mouth is watering just thinking about it. For those not so explorative types, yes, they do have a plain cheese option as well! Located in the same plaza as The Natural Sisters Cafe, Joshua Tree Health Foods is the spot for all your organic and natural food desires. What started at the local farmers market, to being served and sold in local cafes and stores, to now having its very own home in Joshua Tree, The Joshua Tree Coffee Company is my all time favorite coffee. Sure, I may be a little biased being that it’s JT grown, and Royce, the owner, (pictured) is an awesome guy, but it’s truly some of the best coffee around. I’m currently blogging from Ohio, far from the JT Coffee Company, but guess what made the 33 hour road trip home with me? That’s right, a bag of JT Coffee beans. Located in Yucca Valley and next to Cafe Ma Rouge, housing an eclectic blend of new and vintage, bohemian, biker, rock & roll, and western items, is Hoof & The Horn. As a self-described non-shopper, it may be surprising that I never miss a jaunt through this amazing shop and almost always walk out with something. If you thought drive-ins were a thing of the past think again! Smith’s Ranch Drive-In Theater, located near the military base in Twentynine Palms, just went digital, so it’s sticking around for a long time to come. Grab yourself some munchies and enjoy two flicks for only $5 a vehicle. Not far from Joshua Tree in the town of Landers sits the Integratron, which, according to its website, is a “resonant tabernacle and energy machine sited on a powerful geomagnetic vortex”. Whew. I went there once for a community star-gazing party and got a free taste of the sound bath. I can’t really comment on the energy machine/geomagnetic vortex claim, but if you’re looking for something unique and fascinating, this is definitely the place to be. Down an unmarked, unpaved road from the Integratron is the Giant Rock. The Native Americans considered this site to be sacred and in the 1950’s it was a gathering point for UFO enthusiasts. It the 1930’s a man actually dug a hole and made his home underneath it. Although now it seems to be a gathering place for graffiti enthusiasts, if you don’t mind the bad art it’s definitely worth the visit. If free-roaming donkeys, community style living, outdoor showers and “stone” houses in the shape of teepees are your thing, or even if they’re not, you must get your behind over to Garth’s place known as Boulder Gardens. Stay for a few hours, a few days, or a few months. Heck, I met someone who had been staying for years. All are welcome as long as they’re “conscious-minded and truth-seeking”. I just happened to be curious. If 10 days of silent meditation sounds like your kind of thing, do it for free while enjoying some great vegetarian fare at The Southern California Vipassana Center in Twentynine Palms. Yeah, I thought it sounded crazy too, until I did it. Built in the 1940’s as a movie set to emulate an old western town and where over 200 movies and tv series have since been filmed, Pioneertown still stands to this day. Take a stroll down Mane Street and play on all the sets before heading over for a bite to eat at the nearby Pappy and Harriets. If you hit it on the right day, (Saturdays @ 2:30), stick around for the Mane Street Stampede Wild West Show. During my most recent visit to JT I spotted a flyer announcing a performance by an international artist in residence at the Harrison House. Arriving in the evening, the cozy adobe and straw structure, which was meticulously designed for great acoustics, was dimly lit and magical. The website describes the experience of being inside as having been likened to a chapel, mosque or temple. As much as I hate litter, I always enjoy coming across random junk in the desert because there’s something weirdly fascinating about it. Artist Noah Purifoy created a 10 acre outdoor art museum made entirely of such junked material, and it’s a must see. It’s free to boot! There are over 20 designated hikes in the area and each one is vastly different from the next. So, what are you waiting for? I had a lovely time at Instant Karma Yoga and highly recommend it. Drop in a class for $12 and instantly feel like a JT native. I always look forward to a Saturday morning Joshua Tree Farmer’s Market stroll and inevitably leave with a bag full of goodies. Located in the same parking lot as Natural Sister’s Cafe and Joshua Tree Health Foods, hunting for healthy fare couldn’t get any more convenient. If you were hoping I’d suggest a great hotel you’re out of luck: I always camp when visiting Joshua Tree. From 9 different campgrounds ranging in fees from $10-$15, you can save your money to experience other “bests” in town while getting back to nature and star-gazing. You’re in the desert – there’s no better place to do so. So that’s it – my round up of Joshua Tree’s best of the best! Did I miss something, leave something out? I’d love to hear from any locals or frequent visitors – what are your favorite places? Let me know in a comment and I’ll be sure to visit during my next trip. There’s always a next trip to Joshua Tree!